Its been a fast-paced start to 2019, and it seems like we just started. But, here we are almost a quarter of the way into the year. Things have moved so fast that I looked up, and realized that my last blog post that I wrote was back in October 2018 (!!!). One of my “resolutions” this year was to spend more time writing and sharing the cool things we find as it relates to SEO and digital marketing. Its something I really enjoy doing, and I love to teach and train and develop our team. So let’s make up for some lost time and explore a “Cliffs Notes” version from the last couple of months. Because I hadn’t heard the phrase used before, I’m going to take credit for coining the phrase “proximity rankings“. Its something that I’ve struggled to communicate and prove for a few years to local clients. Rankings for local results (Google My Business listing) will change based on where the searches are performed in proximity to your business location. A search close to your location may show higher results, and the area where you rank in the top three results would be your visibility footprint. We’ve had success improving the size of the visibility footprint for clients, and that’s a difficult thing to represent. We’ve been building a solution for this for our franchise clients that hooks in to Google My Business API to pull insights and other data. We’ve got a working prototype that we are continuing to develop, and hope to roll out later this year (more on that later). Local Falcon beat us to the visual local rankings part. This is one of my new favorite tools for local SEO, as you can get local rankings within a designated area visually on a map, and watch the footprint and rankings grow over time. Unfortunately, you have to re-crawl and screenshot the data or export the CSV for updated rankings, but for now, it meets a need until we finalize our internal solution. This tool has helped us visually represent how rankings are influenced over time across the area in proximity to your business. Clients have really liked the visual rankings as well. SEOteric provides hosting for our website clients, and we’ve made some great strides in our hosting infrastructure. We’ve employed an NGINX and Redis caching utility, automated SSL security certificates, and reduced load times across the board. The big item here is our centralized datacenter management utility that our co-founder built. This solution streamlines management across several data centers, including managing development, staging, and production environments. It also helps control SSL and canonical configurations, redirects, logging, monitoring, troubleshooting, diagnostics, website deployment and upgrades, revision tracking, and backups. This solution has and will allow us to scale hosting operations to new levels, all while improving performance and security for all the sites we manage. Since my last post, we’ve seen at least 5 pretty significant Google updates. Google updates their algorithms hundreds of times per year, and a few of these updates have a big impact on rankings. Many of these are unconfirmed updates, meaning, Google didn’t make an official announcement. We did get a confirmed update on March 12, dubbed the “March 2019 Core Update”. It was first called “Florida 2” by some in the SEO community, but it wasn’t related to Florida 1, so the naming convention didn’t stick. 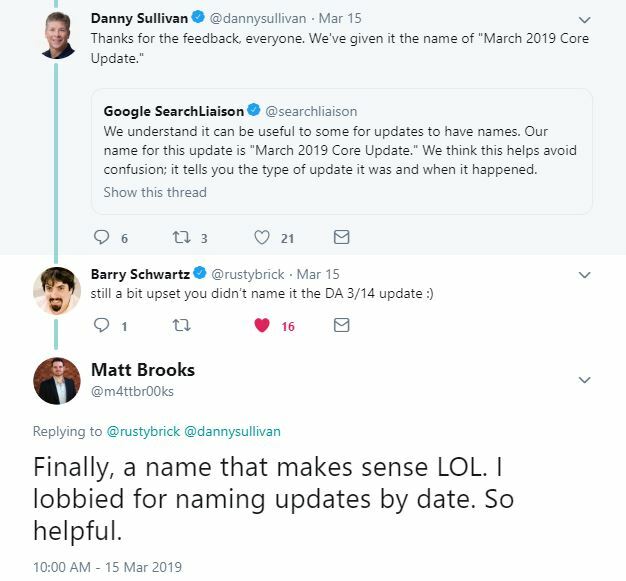 I had sent several feedback messages asking for updates to simply be named by their dates, and with my (and many others) feedback, we did get an official name from Google. Since this is a broad core update, it typically means that Google is refining how they define and rank quality websites and content. The “fix” for these types of updates typically involves becoming a better resource for the topics and keywords you are targeting. We look at how results change, and who the winners and losers are to find what factors may have been refined. Then we can work towards improving the overall page and website quality. We had some pretty big winners on March 12th and 13th after implementing several months of site quality updates. Earlier this year, we were fortunate to bring on Daniel Luft as our new Creative Director. Daniel brings great vision in branding and website UX/UI, and has helped us further refine our landing page design and development. We’ve also brought on some digital marketing interns from the University of Georgia this year, with the hope of retaining some of them for full-time positions. We’ve had a great partnership with UGA and the New Media Institute that we hope to continue to develop. We have an employee based agency instead of a contractor based one, as we feel strongly that our culture and commitment to the brand and our other team members will help us continually improve. Its a big part of what we love about our work. The second quarter of 2019 has a lot of exciting things on the horizon. We’ve got several website launches planned and a big push to migrate from Yoast to The SEO Framework as our SEO plugin for WordPress. We’ve got a datacenter migration planned that will be moving several dozen websites to our new hosting infrastructure. I’ll also be writing an update specifically about the SEO plugin transition soon, as we’ve got some great data and benchmarks supporting our migration.